This worksheet was designed for anatomy and physiology students who are studying the senses. The unit starts with general (somatic) senses and then moves to special senses, such as they eye and the ear. The coloring worksheet is intended to help students learn the location of specific parts of the eye, like the cornea, sclera, lens, and retina. 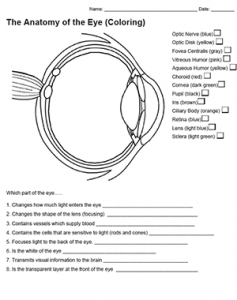 Students can reference their notes or the book to learn the functions of the parts of the eye. I often have eye models available for students to use while the color or during the dissection. The final activity for the unit is the dissection of the eye where students identify the structures on a preserved cow eye. Students are encouraged to take apart the eye to locate the structures and share photos on twitter with #coweye.